Last year, Wilf and I decided to attend the North American Spitfire Squadron Spit together at the Mid Ohio race track. At the same time, we visited some friends in Wisconsin and, for the drive home, we’d decided to take the long route, which took us over St. Sault Marie and North Bay. The trip totalled 3500 km, and when we finally arrived back home we realized, that we had completely surrounded all five Great Lakes. What is so special about this trip? We had our Spitfire in tow on a trailer we had borrowed from a friend. One flat tire. During this trip we realized, though never wanting to own a trailer queen, most of our outings would be a camping/driving combination and we decided, that we must own our own trailer. Building a trailer wasn’t new to us. Over the years, we’ve build a few of them. The designing and fabrication started with the first snow fall, and now that it’s finished, we want to share this project with you. Loading deck 14 by 6 feet, the front pointed to give it a smaller appearance, and to keep the tongue shorter for easy turning without losing loading capabilities. We opted for a wooden deck, this making the trailer a multipurpose functional one. 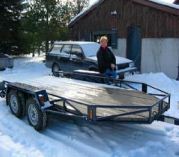 The wheels run on the outside, which widens the trailer to 7 ½ feet. We used tandem axles with springs for an easier ride. Empty: Slightly over 500 kg [1150 pounds]. Gross weight: 2000 kg [4400 pounds]. We purchased two used Chevy Cavalier axles [from a 1985 model], consisting of drum brakes and five 13” wheels, from a scrap yard. The older model of the Cavalier has flanged-on spindles. The flanges from the donor rear axles were cut off and welded to 2” by 2” by 3/16” tubing beams. This design lowered the centre of the axle by 3”, which will give the trailer a lower ride. The tongue we used, which also accepts the coupling, is a 3” by 3” by 3/16” square tubing, 7 feet long. To this beam, we welded a jack, which gets folded up when the trailer is in use. We also welded a bracket to the beam, which will accept a winch. There are many different ways to build a trailer frame. We had used, 1” tubing [pipes], available. We therefore decided on a tubular frame, which is very strong and light weight. By installing the springs’ over axle, the height of the deck is approximately 18 “, which reduces the length of the ramp. Springs should be trailer springs, no longe r than 2”, capacity of 1500 – 2000 pounds. A tandem equalizer should be used between the springs an each side. The drum brakes were installed only on the front axle, activated by the coupling [hitch] as a run-in system [surge]. This application requires a back-up lock. We used a solenoid [central locking system from BMW]. There’s also a solenoid valve available for the hydraulic line. The wheels of the trailer should be aligned; O-camber is fine, wit a 1/8” toe-in. This can easily be done since the spindles are flanged to the axle beams. We made nice shims from a Budweiser beer can. Balancing the trailer: Care has to be taken to balance the trailer. The location of the axles is crucial. The tongue weight of the e front-engined, the proper loading position has to be found. We fabricated them, using 20 gauge sheet metal. The sides were bent on a metal bender, each fender in 2 sections then welded together. We had used Hyundai marker lights available to us. Also seal beam tail lights from a transport truck. We would have preferred LED lights. We used heavy aluminium beams, left over from a rectangular swimming pool and welded together a ladder-type structure, that hooks onto the trailer [make sure the ramp has a security latch, and will not fall off when in use, ask me how we know of this]. When not in use, the ramps are stored under the trailer. Welding of the space frame : We used an arc welder, however a MIG welder with ¼” welding capabilities would have been preferred. We recommend POR 15, brushed on. We made the mistake spray- painting our trailer, which was a waste of paint with too many misses. Only the fenders should be spray painted.